It's quite difficult to visualise that such a thin structure as a leaf is made up of several layers of cells. Imagine putting a leaf flat on a surface and cutting across and then looking end on at the cut edge. The image on the left shows what you would see under the microscope if you took a very thin slice from that cut edge. Unfortunately, without access to sharp blades or a microtome, it can be quite hard to get thin enough sections to view the cut surface in detail. However, one layer of the leaf, the epidermis, can be studied quite easily without need or danger of sharp blades. The epidermis is the outer layer ("epi" - outside and "dermis" - skin) and is found on the upper and lower surfaces of the leaf. 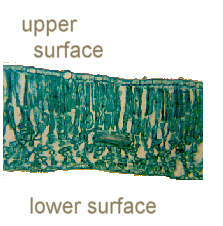 Nail varnish can be used to make a "cast" of this surface which can then be viewed under the microscope. The images below show a variety of different leaf surfaces and it can be seen that there is not only variation between species, but also that in certain plants, upper and lower epidermis differ in stomatal distribution. (You'll find more more information on the structure and function of stomata in a previous article in Micscape ). Try laying a tooth pick along the leaf and include it in the varnishing process. Makes it much easier to peel off a section.